As an avid fisherman, Chris decided to take it to the next level by using his years of experience to help other fish enthusiasts get their “Big Fish” story. Talkin’ Trash made its debut to the sea in 2015 and has been a force to be reckoned with since it hit the water. 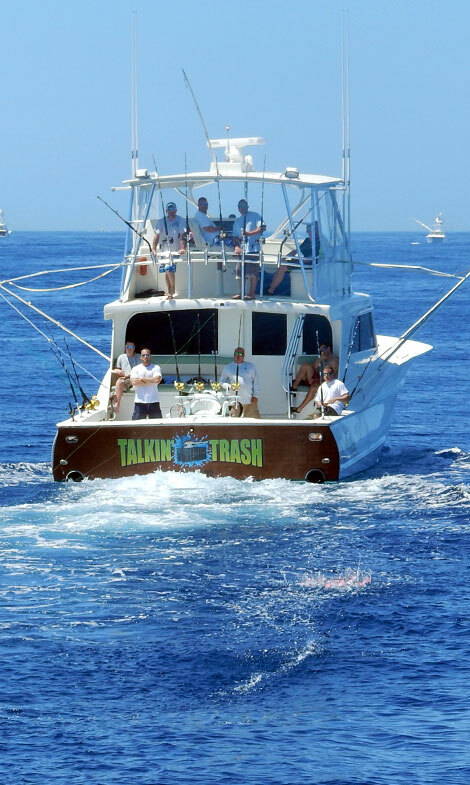 In 2016, Talkin’ Trash was one of the Top 5 Tuna Charter boats catching 300+ tuna. Chris’ excitement for the sport and competitive nature makes him one of the best Captains around. You won’t find anyone else that is as passionate about the sport as Chris, he isn’t just steering he wants to catch fish sometimes more than his guests! He is constantly keeping up on all the latest technology and techniques and has even traveled all over the US and to other countries to find the best secrets of the trade. Our boat is a 2007 58′ Gillikan Custom Carolina powered by two 825hp MTUs with a 25 knot cruise speed. In addition to Chris you get a world of Experience with his mates! • Captain Tony Battista started fishing at the young age of 7, he has 45+ years of fishing experience. Mahi Mahi is one of his favorite species and really enjoys deep dropping for Tile Fish and Sea Bass, we like to refer to him as the “Bottom Fishing Guru”. • Captain Keath Puller has 15 years of offshore and 20 years of inshore experience. He is also the owner of Pullers Lures (the only Lures Talkin’ Trash uses) and has placed among the top in numerous Striper/Tuna/Mahi tournaments. • Brian Skillman has 30+ years of offshore fishing experience, he has placed in the top in numerous tournaments including winning the White Marlin Open! Book your charter with us today and let our years of experience make your fishing trip a memory you will never forget!